Heat oven to 350° F. Line 8-inch square pan with cooking parchment paper, leaving a few inches of overhang on 2 sides. Place 2 cups of the oats in large bowl. Add remaining 1/2 cup oats to blender or food processor; pulse into a rough flour. Add oat flour to bowl of oats. Add baking soda and salt to bowl of oats; stir. In microwavable bowl, microwave coconut oil uncovered on High just until melted. Stir in honey, sugar and vanilla; add to bowl of oats. Stir well to coat oats completely. Spread mixture evenly in pan; press down firmly and evenly. Bake 20 minutes. Oats should be golden and smell of honey. Cool on rack 10 minutes. Remove from pan using parchment overhangs. Cut into 8 rectangles while still warm. Cool completely before wrapping. The bars will firm and crisp up as they cool. 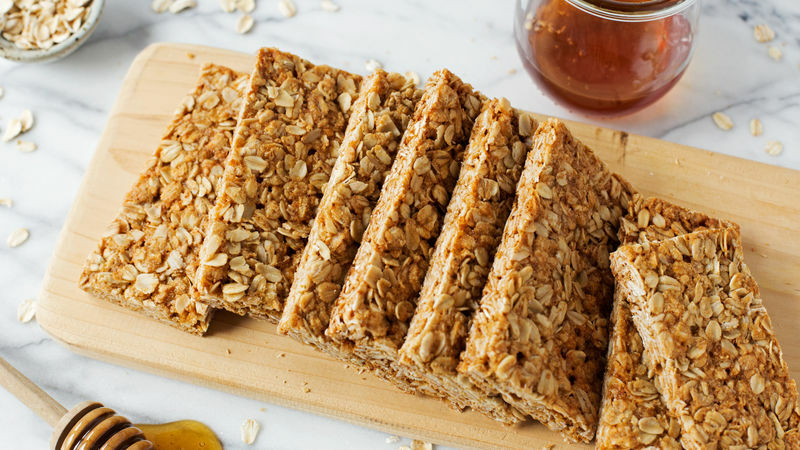 Use a measuring cup or sturdy glass to aid in pressing down oats before baking. This will help ensure bars hold their shape after cutting. This recipe calls for coconut oil, but you can sub canola oil if you prefer (the texture may be slightly different). Make these bars extra sweet and add some coconut flakes or mini chocolate chips.